Legazpi City, [09.29.17] – Police investigators of Masbate City Police Station are still working to make a breakthrough to solve the murder of Masbate 2nd District Board Member, Dione “Jojo” Suplito Lopez. PRO-5 Regional Public Information Officer. Police Senior Inspector Malu C. Calubaquib told The Philippine Examiner that the investigation on the killing of Lopez is still on-going and is still waiting for the progress on the police investigation on Friday. 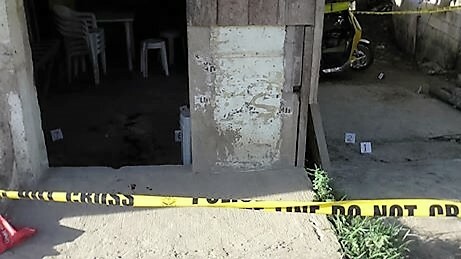 Scene of the crime in Barangay Kinamaligan, Masbate City. Phot by Jesse Parion. Board Member Dione “Jojo” Suplito Lopez, 2nd District of Masbate was gunned down last September 27 by still unidentified motorcycle riding suspects inside the JMC Store, a local carenderia along the National Highway in Barangay Kinamaligan in downtown Masbate at 4:00 o’ clock in the afternoon. Lopez was with his two employees who was identified by responding police as Danilo Comabig y Canico, 49 years old and Genny Culibar y Fuentes, 38 years old, all of Aroroy, Masbate. The suspect fled on board on a black XRM single motorcycle towards the direction of Barangay Malinta. Lopes was rushed to Masbate Doctors Hospital but was pronounced dead on arrival due to six fatal gunshot wounds.